I have created a Restaurant Reviews app based on Yahoo! Maps. The cool thing about it is that it might be the first Yahoo! 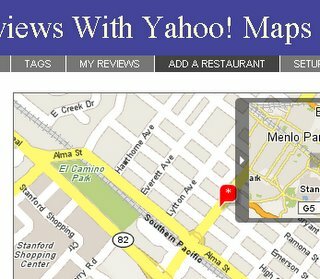 Maps app that automatically chooses between the Flash and AJAX versions of Yahoo! Maps, depending on the capabilities of the user's browser (using code from Macromedia's Flash Detection Kit). Here are a couple of PHP classes that others can use to do the same thing: YahooMap.php, FlashDetectionHelper.php. (Actually, under the covers it lets you switch between Google Maps and Yahoo! Maps at will, but I commented that out to keep it simple). (Props to Nancy Chacko for testing it out and generally stomping on it, and to David Sklar for writing the original Restaurant Reviews). posted by Jonathan at 11/16/2005 04:59:00 p.m.
By Jayson, at 11/19/2005 7:25 p.m.
By Jonathan, at 11/22/2005 11:23 p.m.
Whoops - Victoria, not Vancouver. But anyway, BC. By alex, at 12/28/2006 6:06 p.m. Thanks for making this great free application. I've been looking for something like this, for a friend who wants to write some restaurant reviews. I've created a test site, but find that I can't make maps for restaurants in Toronto. I'm surprised at this since your profile says you're in Victoria. Is it a limitation of Yahoo maps? Am I doing something wrong? By alex, at 12/28/2006 6:10 p.m.
Hi Alex - Try http://restaurants.ning.com - it's an updated version of the Restaurants app and it works for Canadian addresses. By Jonathan, at 12/28/2006 6:15 p.m.
By alex, at 12/28/2006 6:30 p.m.